After several successful modification it was necessary to unite all in one project. The transverter was tailored according to the parts that are found in the drawer, and some improvements are possible indeed. The PCB is a copy of the original W1GHZ project with a few minor modifications. As seen in the diagram, another type of mixer (RMS-30) was used. The MMIC on the RX side was replaced with the INA-02186 and lately with the MAR-6. The output MMIC ERA-5 was replaced with SNA-586 and the resistor combiner/splitter was replaced with the PIN diodes. The first thing you notice is that the PCB is almost half size because there is no L.O. multiplier included. Instead of that there is just a SMA L.O. port connector so IF of 144 or 432 MHz can be used with the appropriate external local oscillator ( 1152 MHz or 864 MHz). The RMS-30 mixer has a slightly different pin-out so small modification was required also here. The top PCB TX side remained untouched, together with the part where PIN diodes are inserted. The PCB RX side is slightly changed, now allowing 2 MMIC on the RX side if required. The PCB bottom side is mainly the ground layer. The PIN diode modification was done mainly on the bottom side. The splitter resistors are replaced with the diodes and a holes for the wires are drilled through the board connecting both PCB sides. After that at the bottom side, the pads are cut with the sharp X-Acto knife creating the soldering pads for the PIN diodes network (resistors, coils and the capacitors). The outcome is higher isolation between the ports and lower loss comparing to the resistor splitter. The PCB tracks are then extended to the RX/TX power supply pads allowing the switching using the same voltage. The transverter was ready for the test. Connecting the external L.O. ( 864 MHz ) and the IF radio ( 432 ) Mhz the RX part was tested first. Immediately, there was a high noise on the RX side indicating that the RX part is oscillating. Adding a few extra via to the MMIC ground pads helped a little bit but under the some conditions the INA-02186 was oscillating again. The known problem was not easy to solve, the 1.6 mm FR4 was too thick for INA-02186. At the end the RX MMIC was replaced with the MAR-6 with surprisingly good result. It's true that MAR-6 can give us less gain and higher NF comparing with the INA-02186 but the transverter is very stable, not showing any sign of self oscillations under various conditions. Housed or not, with or without the extra LNA on the input, with the high input signal the MAR-6 was a simple solution for the home-brew PCB with via done by simple wire. The TX side of the transverter performed very well after the first test. All the MMIC voltages were according to specs. and no sign of oscillations were noticed. The output power is 40 mW. The transverter was tested with the IF drive of 1 mW on the 432 MHz from the FT-817nd through the 50 ohms attenuator and with the 6 mW of L.O. power on the 864 MHz. The signal was clean and stable. Both the transverter and the L.O. were housed in the box made from the scraped nescaffee can metal sheet. The final version can be built without the numerous SMA connectors using just the semi-rigid teflon coaxial cable for connecting all parts of the transverter. Using so many SMA connectors can be costly and some builders don't have the access to e-bay or any other possibility to buy the connectors. At the end, the idea was to build simple and cheap rover transverter. On the other side, the modular approach will allow us to build and test all units separately avoiding the headache when trying to resolve the problem on the finished not working transverter what can be very important for inexperienced builders. More over, this approach give us the possibility to experiment with the various L.O., LNA, final power amplifiers, changing the set up very quickly and choosing the right one. Various test were performed with the transverter to assure that all is working properly. On this video you can see the RX part receiving the beacons ( lower signal are beacons 100 and 250 km away). The strong signal is the 1 watt local beacon running on the 50 ohm dummy load located in the next room not more than 10 meters away. The noise appearing every 10 seconds is the AN/FPS-117 radar running some 30 km from the location with the clear LOS. Inserting the sharp response 23 cm filter before the front-end did not improve the situation because this is the in-band disturbance. 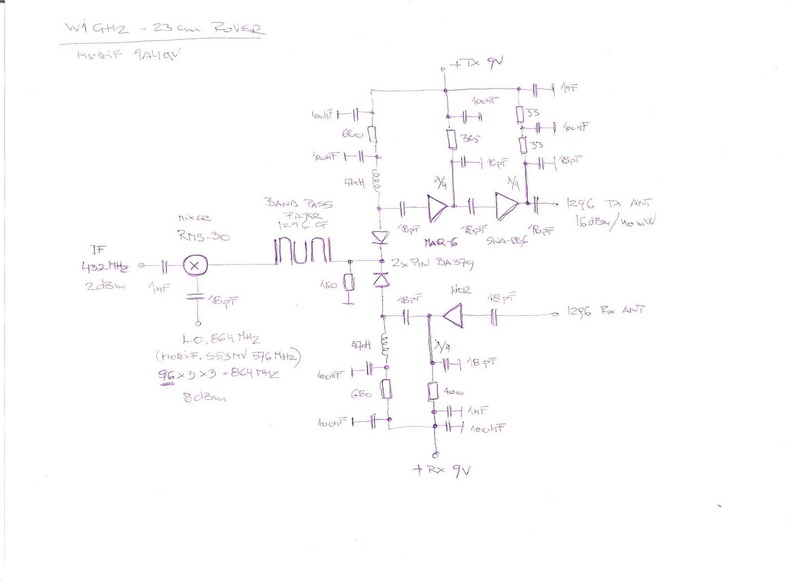 The RX MMIC was just a MAR-6 so don't worry to much especially if you plan to use extra LNA on the RX side. The antenna was just a simple 25 el. loop antenna. The second video is showing the same setup but with the YU1AW LNA using the BFG-540x as active component. Even not screened the LNA and the transverter performed excellent showing no sign of instability. Adding the LNA I improve the overall NF and a total conversion gain. The same beacons signals were checked. It is not easy to notice the difference on the video due to the local QSB but improvement is obvious. Presented modular approach give us the possibility to use different L.O. with the different I.F. radios to reach the 23cm band. 144 or 432 MHz or some other I.F. depending on the radio you have requiring the proper L.O frequency. For the L.O. we can use the PLL, DDS, or some other way of generating the signal, today quite popular Si4133 with the possibility to program any frequency from 400-1900 Mhz in 1 MHz steps. Bearing in mind the simplicity of the rover transverter project I choose the old fashioned crystal multiplying chain starting with the 96 MHZ crystal. After multiplying, the final frequency was 864 MHz. This frequency constrain us to use 432 MHz for the I.F. which is simple but not the best solution considering the well known mixing products problem when using 432 MHz for the 1296 MHz I.F. Anyhow this is more acceptable than running the 1440 high side injection with the reverse 144 MHz LSB tuning. Most of the radios are blocked and can not even tune below the 144 MHz and other suffer with the lover sensitivity out of the band. The good thing is that the filter response is also better if we use the 432 MHZ I.F. The simple and good oscillator chain is basically S53MV 23/13 cm transverter oscillator with the simple modification. Instead of the original 576 MHz oscillator following the 96-288-576 MHz chain I tune just the last multiplier to achieve the 96-288-864 MHz chain. The signal was clean and stable, power 6-7 mW. If you prefere to use 144 MHz (right side up) for the I.F. 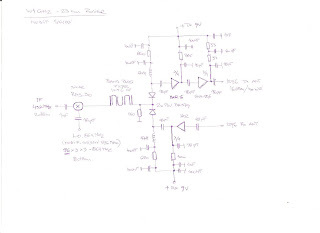 than the same 576 MHz oscillator can be used adding another multiplier stage to reach 1152 MHz. At the end just a brief report regarding the cheap relay that Paul is using with the rover transverters for the antenna switching. During the last year Friedrichshafen HAM flea market I get the surplus aluminum milled box with 5 SMA connectors, several MMIC, smd directional couplers and other handy parts including 2 peace of the OMRON G6Y-1 relays, all that for just a few Euro. The unit was part of 900 MHz GSM equipment. It is true that this relay was the 5 volts type but at the end this was the advantage because we are using 8 or 9 volts for our transverter RX/TX stages. Relay, 78L05 voltage regulator, 2 smd blocking capacitors, 1N4006 protecting diode, a peace of 0.8mm FR4 and 3 SMA connectors will give us the coaxial relay able to handle 10 watts of the RF power (sequenced) on the frequency of 1 GHz with the I.L. of 0.5 dB. Not bad at all! The double side 0.8 mm FR4 PCB was tailored where 50 ohms tracks are cut with the X-Acto knife. SMD blocking capacitors are soldered on the bottom side just close to 78L05 pins, together with the relay protecting 1N4006 diode. Even lower I.L. can be achieved soldering the coax directly to the PCB without using the SMA connectors.